We’re halfway there! Halfway through winter, that is. How’s this season been for you? Where I live, it’s been the coldest winter in years and the flu has hit record numbers. Joy. When I say, “Yay, we’re halfway through!” what I’m really thinking is “I cannot believe we’re only halfway through.” It’s been winter for forever. But! Whether or not the Groundhog sees his shadow today, we have a ways to go. To get us through this often doldrum-ish time of year, we’re asking the question, “What’s Saving Your Life Right Now?” I’m once again linking up with Modern Mrs. Darcy and other bloggers on this mid-winter day to share some of the little things that are making life easier or more enjoyable this winter. Join us in focusing on the good stuff! Grocery Pick-Up + Plan to Eat – Life. Saved. Weekly. I never thought I would be a mother who couldn’t stand taking her children grocery shopping with her. Oh, but I am that mother x 20. Now, I can simply make a meal plan on Plan To Eat and then put everything from my Plan to Eat list into a cart online at a grocery store (several stores do this but the closest one to us is Walmart), and someone else will get all the stuff for me! And check it out and put it in bags! All I have to do is show up and put it in my car. Yes, thank you. Sure, some mistakes are made, but heck, some mistakes are made when I do my own shopping. It’s a no-brainer for me right now. And my adoration for Plan To Eat could take up a whole post on its own. I have been using it for three years and I hope to never, ever stop. All my recipes are there, and all I have to do is drag them onto the calendar on the day I want to serve them. Then, Plan to Eat generates a shopping list. I loathed meal planning before I started using Plan to Eat. Now it’s not so bad! 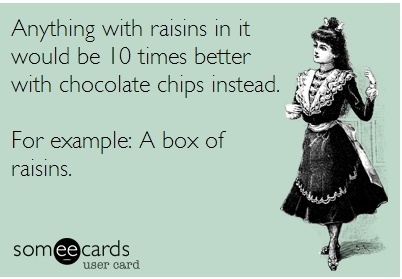 But if you can’t have the chocolate chips without the raisins, well then, where I live, you eat the raisins, too. 3. Illy Coffee – New favorite splurge! It’s so rich and delicious. And also pricey, compared to our usual Seattle’s Best/Elixer of Life, but sometimes I find it marked down at T.J. Maxx and then I try not to shriek with glee in the middle of the store. 4. Electric Mattress Pad – I love warmth so much, and hate cold equally. I told myself this is the year I would finally buy some flannel sheets and save myself from freezing cold cotton sheets, but my husband beat me to the punch and purchased this thing when it was on sale before Christmas. It’s heavenly. The only downside is getting out of bed fifteen times a night with little ones is extra difficult. 5. Google Keep– When I’m overwhelmed with tasks and things to remember, I go back to the Facebook Live video by Aimee Kolmansberger that made me realize my brain is meant for focusing and creating and not keeping all the things organized and at the forefront of my mind. A lot of times, the overwhelm will happen when I’m driving or in the middle of something else. Enter technology! I like Google Keep because I can open a note in the app, click the mic button and start telling the app everything I have to do. Then I can go back to it later on my computer or phone and make a plan of attack when I have time to do that. I also keep notes of funny things my kids say, stuff I need to put in Baby books (one day), or books to check out at the library. Another perk of Google Keep is my husband and I can share grocery lists and to-do lists and whatever other notes. It’s like a shared bulletin board that goes with us everywhere. I’m a fan! 6. Seashell wreath – When I look at this wreath above my desk, I remember that there is such a thing as summer, sand, waves and warmth. I’m transported to Oak Island, NC, our family’s vacation spot since I was a little girl. My mom made this wreath for me for Christmas from seashells she has gathered over the years, and it’s by far my favorite home decor in my house right now. 7. The Psalms – I decided to read a Psalm a day in 2018. Best decision of the year so far. 8. The Great British Baking Show – I don’t like to cook a whole lot, but I’m actually inspired by this show. It makes cooking/baking into something more than drudgery. Maybe it’s the English country side and the soft music, but all of a sudden, I kind of feel like an artist when I craft something for my family. I get new ideas and I also relax and watch a TV show, which is a novelty in and of itself! Last week I up and decided to make a homemade chicken pot pie because of this show, and it actually turned out beautifully. 9. Thriftbooks. Even better than The Book Depository! For all your old book needs (which are mammoth in my life). So those are the small things saving my life this winter! And all of the things on my last winter’s list are definitely still in my daily mix of favorites as well. What’s on your list? I hope the rest of your winter is short and wonderful! Back in February, I joined up with Anne Bogel and other bloggers to post about what was saving my life in winter. For sure, winter can be a bleak time when we need some life giving practices and a focus on celebrating the small things. It’s easier to thrive in the summer. Still, there are challenges in summer that make life a bit heavier than we’d like. Take swimsuit shopping, for example. Or cooking in 100 degree weather. So I thought it’d be fun to do a favorite things post in the summer. Because you know I’m always on the lookout for favorite things after failing to have any favorite things a year ago. Here are a few of my favorite summer things this summer! Target Swimsuits – I told myself I would be a serious swimsuit shopper this year. I’ve had the same suit for three years and I was sick of it, even thought it was holding up surprisingly well for a $30 Target swimsuit. I scoured all the boutique websites friends were posting for great swimsuits, but nothing called my name. (Shout out to Camellias and Copper for collecting some great options in this post.) Then I happened to be passing through Target with only one child in tow, and thought, “Hey, I’ll just look real quick.” And I found a suit I loved in less than ten minutes. Sold! Apparently I am firmly in the Target swimsuit camp. I’m simply not a serious swimsuit shopper yet. Aldi Super Premium Ice Cream – Aldi is currently selling ice cream with only five ingredients in it – cream, sugar, eggs, milk, and cocoa or vanilla flavor. It is so choice. And only $2.99. Also, their Mango ice cream bars are highly addictive. Short runs – It’s pretty cool how “in” it is to run in 5ks, 10ks, and lots of other ‘Ks these days. We need better health in our country, and the popularity of running can only be a good thing. But I’ve come to grips with the way I run right now, and that is not with a lot of ‘Ks. My 10-15 minute run three times a week isn’t going to impress anybody, but I love it. I’m up early, I’m outside, I’m moving my body and breathing hard, but I’m not wearing myself out in this time of life when I’m already pretty dang tired. Wicker chairs – I got two of these wicker chairs from my husband for Mother’s Day/Our 12th Anniversary (they were on the same day this year), and they were every bit as wonderful as I thought they’d be when I oh-so-helpfully e-mailed a link to them to my husband a few weeks before Mother’s Day. (I’m learning.) I love sitting in these every chance I get, but especially early in the morning with coffee. Games with my kids – I am not as good as I once was at playing imaginatively these days. It’s sad, but I’m too tired and too distracted by my endless to-do lists. I still want to engage in play with my children, though, so having the perimeters that a game gives is invaluable. Our current favorites are Labyrinth and Authors. Uno and Monopoly, Jr. are also go-tos, and our favorite preschool game is and probably will always be Hi-Ho, Cherrio! I’m hoping to get Old Maid soon, another simple card game I think my kids would love. Ektorp Ikea couches – I’m telling you, once you have a couch that is washable, you might never go back. I’m livin’ the dream here. Sweaty kids/self? Spit-up from baby? Blood from the giant cut my son somehow didn’t realize he had on his foot? The dreaded stomach bug? It all comes out in the wash. They are quite comfortable, too, even according to my husband who was pretty resistant to the idea of Ikea furniture at first. We are now both big fans. Grass – Grass has made our summer. We’ve been living without it in our backyard for a year-and-a-half, but now that we had a good landscaper come and scrape the backyard of all its ivy and other infestations in June, we have been able to lay down some sod and voila! our backyard is an oasis. Summer vacation to the beach? Not happening this year. But a green backyard is a fabulous trade-off, in this family’s opinion. Book Launch Teams – I’m on two book launch teams this summer that I am thrilled about! Basically, that means I get to read advance copies of books and write about them. I’m like “eek!” inside every time I think about it. 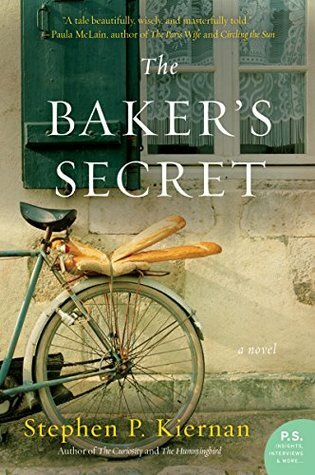 Look for reviews on Ruth Chou Simon’s new book and Melanie Shankle’s new book this month. Both books will release this Fall. These water bottles are so great for older kids. They don’t break, they don’t leak, they keep things cool. Violet had a smaller one, too, but she went all rogue two-year-old on us and threw it away at a baseball park this spring for no apparent reason. Sheesh. Toddlers. They are so cute and equally crazy. Every Mile Mattered – Nichole Nordeman released a new album on July 28th. I’m not a fan girl of any band or musician (other than maybe Switchfoot), but this has been on repeat nonstop on my Spotify app. I especially love her rendition of Beautiful Day. And that wraps up my summer favorite things list! I hope your summer has been full of small and significant delights, and that many more are still to come.